The front triple tree headlift stand allows easy and safe lifting of the frontwheel for repair, maintenance, and storage. 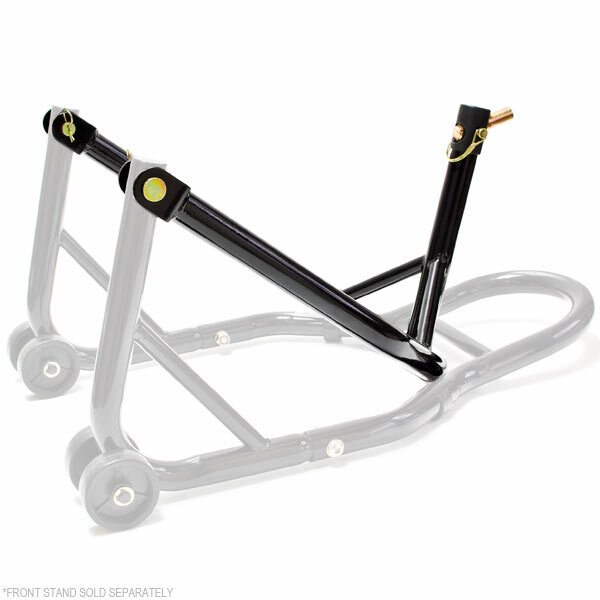 This triple tree lift allows forcomplete removal of the front tire, perfect for wheel changes and fork maintenance.The extra heavy duty steel construction guarantees long life and durabilityin all conditions. The front stand is supplied with 5 Triple Tree Pins: 0.787" (20mm), 0.826" (21mm), 0.905" (23mm), 0.944"(24mm) and 1.062" (27mm). Allows front brake and wheel cleaning and removal.